A Ukrainian far-right leader accidentally shot and killed himself during a shoot-out with police last month, an investigation has concluded. He was a member of the Right Sector - a key player in Ukraine's mass protests. However, group members have so far made no public comments on the inquiry's findings. The Right Sector played a prominent role in the Kiev protests - and the clashes with police - that led to the removal of President Viktor Yanukovych from power. The results of the inquiry into the 24 March shoot-out in the western Rivne region were published on the interior ministry's official website. 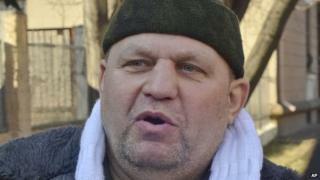 "We will avenge ourselves on [Interior Minister] Arsen Avakov for the death of our brother. The shooting of Sashko Bily is a contract killing ordered by the minister," member Roman Koval was quoted as saying by the Ukrayinska Pravda website after the shoot-out. The Right Sector's continued presence on the streets has complicated the work of Ukraine's new leaders, who have struggled to demonstrate they are fully in control after Russia's disputed annexation of Crimea and violent pro-Russian protests in eastern parts of the country, the BBC's David Stern in Kiev reports. What is more, Right Sector has bolstered the Kremlin's seemingly exaggerated claims that "fascists" have taken over Ukraine's government and are roaming the capital's streets, threatening minorities and Russian-speakers, our correspondent adds.